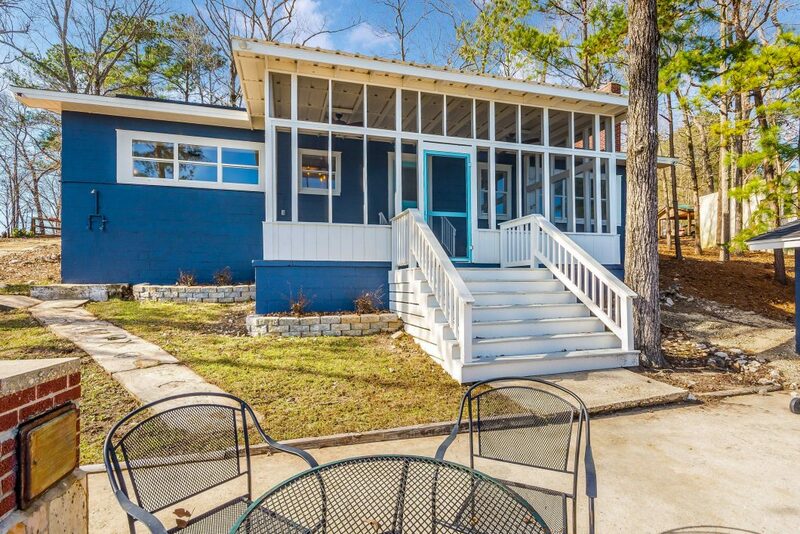 95 Cherry Lane is a cute, blue cabin in the Real Island/Little Kowaliga area of Lake Martin that has vibes of the old days at the Lake but includes all of the modern conveniences that lake homeowners want today. Renovated in 2018 this cabin features marble countertops in the kitchen with stainless appliances and an island ready for a few stools. Open to the bright living room there is also a dining area and lots of windows to take in the view. The living room has a wood burning fireplace and a large hearth for seating. The cabin includes three bedrooms – all with new carpet and two bright, colorful bathrooms with awesome tile selections. The heating and cooling system is new so no need to worry about comfort indoors! One of the best features of the cabin is a large screened in porch – here is your spot to sit and plan your summer! Outdoors there are a few fun projects if you are interested – there are two boat houses. How about making one a man-cave or a she-shed? Keep the other one to store the seadoo or boat trailer. The old school BBQ pit could be upgraded and you could make it look like you are the BBQ Pit Master of the Lake! Just a few chances to make this an even more perfect lake getaway! The popular location of 95 Cherry Lane in the Real Island/Little Kowaliga area comes with big views and deep water. The walk to the lake is a few, easy steps from the cabin since the lot is nice and flat. There are two piers to enjoy too! And a lakeside swing. 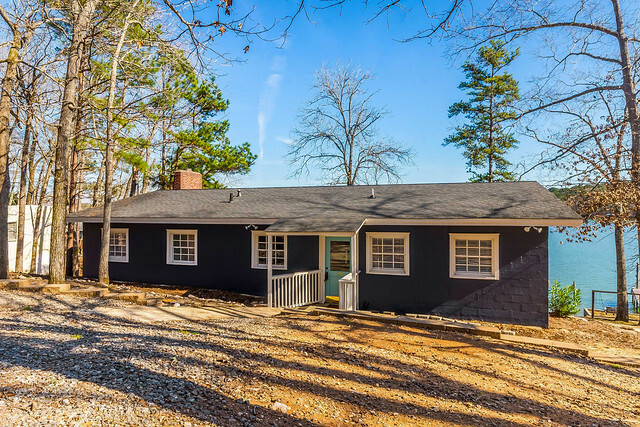 Comfort and ease are what this lake cabin is all about!